Now that you have installed the Combined Community Codec Pack, there are one or two options you may wish to set. Most of the options can safely be left at their default values. However, there are some options you may wish to tweak depending on your setup. Once installation has completed, you will see the window shown below. 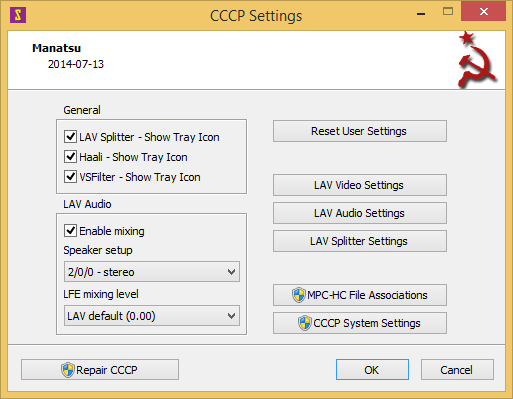 You can also edit these settings at any time by starting the configuration tool from the Start menu or Start screen, simply search for “CCCP Settings” and click on the icon that appears. Most options on this window should be left at their default values, unless you are an expert user and know exactly what you are doing. 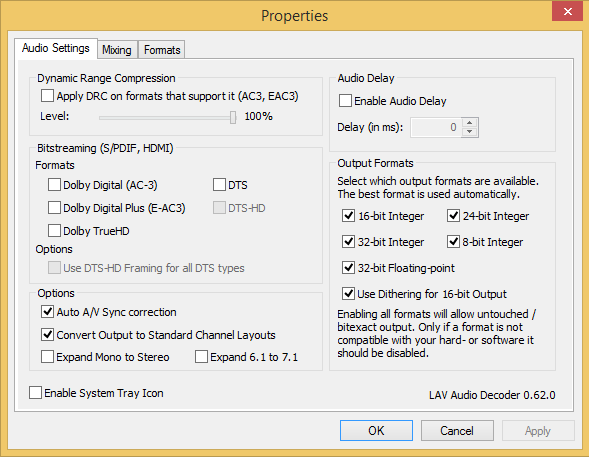 You may wish to configure the speaker settings for LAV Audio however. Click on the list box under “Speaker setup” on the left hand side of the window. You will then see the following options. Here you should choose the speaker set-up that most closely matches your PCs speaker configuration. What do all those numbers mean? They indicate the number of speakers in the front, middle and rear positions. If you only have two speakers, left and right, you should choose 2/0/0 – Stereo (which means 2 speakers in front, 0 at the sides and 0 at the rear). +LFE means “Low Frequency Effect”. This is sometimes called a “Sub” or “Sub-Woofer”. This is a big speaker that sits in a corner and makes only low, bass sounds like explosions. If you have a surround sound system with 3 speakers at the front, 2 at the back, and a sub-woofer, you would choose “3/0/2+LFE 5.1 Channels”. Once you have chosen your speaker set-up, you may want to change the bit-streaming settings. You can skip this part if your PC is not connected to an amplifier or home theatre receiver using either HDMI or optical audio. To change bitstreaming settings, click on “LAV Auido Settings”. The following window will then appear. On the left of the window you can see “Bitstreaming”. Select the formats your receiver supports. Remember, only HDMI cables are capable of transmitting Dolby TrueHD signals. Everything else should be configured for you automatically on this window, so click on OK when you are done. Once you are happy with all the options, click on “OK”. The CCCP is now fully configured and ready for use. To use it, simply open up a multimedia file in Windows Media Player or your favourite DirectShow compatible media player.